Assign a short code on your dashboard profile, choose a style, add it to your sign, collect leads! ListReports offers reusable short codes to all of our Elite subscribers and their paired agents. We use a patent-pending geolocation technology that will allow you to choose your CUSTOM short code and order ONE sign rider that will work for ALL of your future listings! No more buying a new sign rider for each listing—it's one and done. You can choose and assign your own custom short code from your Profile on the ListReports dashboard. Once you've chosen a code, place your order for your new reusable sign rider here. 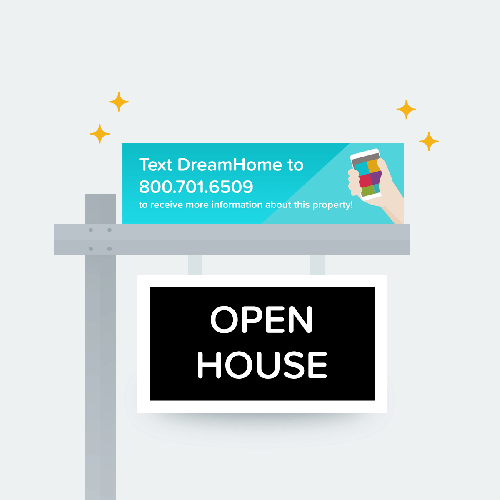 When customers text your custom short code, they'll receive a link to the ListReports property website for a listing. We use our patent-pending geolocation technology to locate where consumers are and return the right property website. 1. Go to your ListReports Profile and assign a short code. 2. Select a sign rider color palette and style in SHOP. 3. Add it to your sign. Please see color templates for style options. Please note: Your custom short code can be set in the Profile section of your Dashboard. The reusable sign rider print-ready file is available upon request through the Shop with printing and shipping starting at $40.